Let’s take a little trip back in time. Back when people were groovy, mustaches were bushy and we took a chance on Abba. 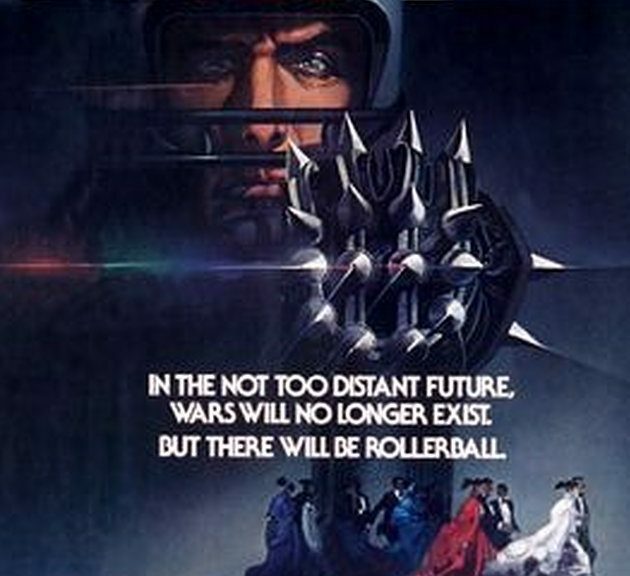 That’s right, we’re back in the seventies and reviewing Rollerball(1975). This is probably a movie you’ve never heard of except to mock the panned remake from the early two thousands. This is a shame because it’s a big idea science fiction film. This is not without its shortcomings of course. Being as it’s a “dystopian” future, everything is mega-corporations. Also, there aren’t countries because of this. James Caan at least gives it his all as he fights back doing the one thing he can, play Rollerball. Weltall then talks about Battle Los Angeles. It’s the Aaron Eckart vehicle where aliens invade earth for water. For some reason, it reads more like a military recruiting tape than a movie about an alien invasion. Everyone not in a uniform dies horribly and even some of those that are. Oh, and Michelle Rodriguez survives because of course she does. Tim then talks about Das Boot(1981). It’s more of a miniseries than a movie about a German U-Boat crew. It’s hard to imagine that a film maker would try and succeed in getting an audience to sympathize with German soldiers during World War II. That this succeeds so well is no small miracle. This was a great episode! More please.